December 9, 2018, Erie Technical Center, Erie, PA - Herr Engineering J-3 Cub on DuBro Park Flyer Snow Skis. See my write-up on the skis. October 21, 2017 Update: While flying the other day, I noticed many strong thermals in the area. 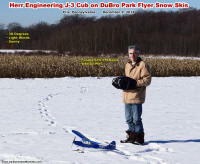 At about 100' altitude I sensed the Cub was in a very strong thermal, so I cut the throttle and started circling. In less than a minute she was to high that I could barely see her and had to break out to start back down. I wish I had installed the HowHigh altimeter that is normally in my Spirit glider in it. It was easily at close to 1,000 feet! 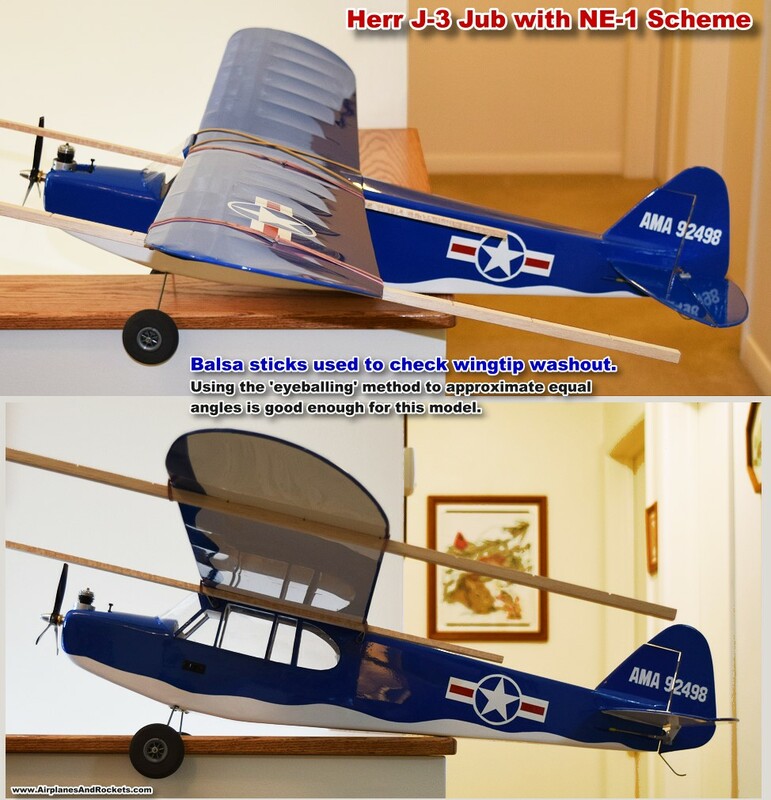 Because of missing the sound and smell of glow fuel model airplane engines, I recently built a pair of Carl Goldberg Li'l Jumpin' Bean ½A control line models. Not wanting to use the vintage Cox .049 engines, I purchased four new .049s from Cox International, in Canada. After break-in and a couple modifications to make them more reliable, they now perform great and will run out a full tank of 25% nitro fuel with good consistency. 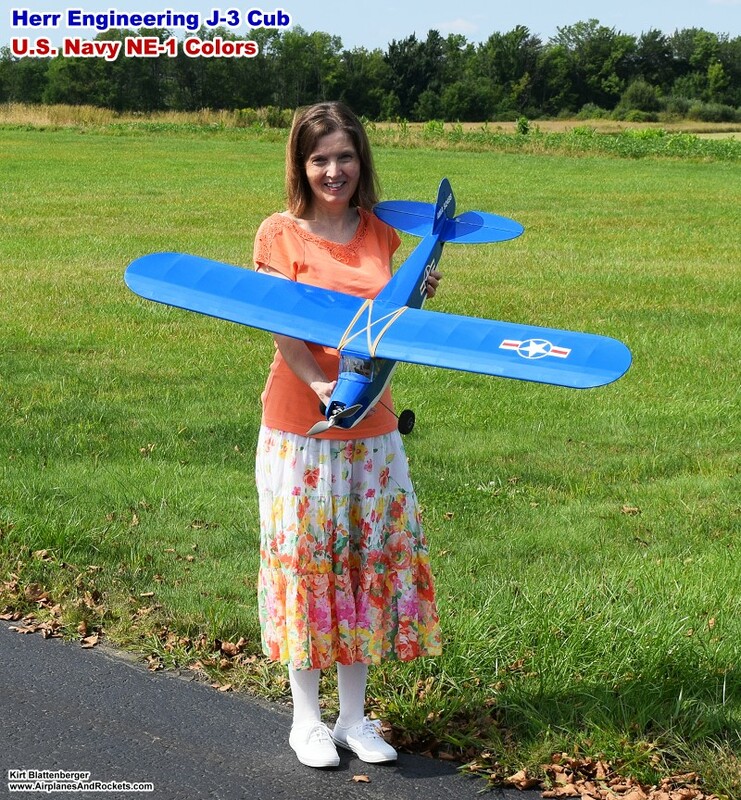 Anyway, I decided it might be nice to build a simple 2-channel R/C airplane with an .049 up front, like back in the early 1970s with my Carl Goldberg ½A Skylane. 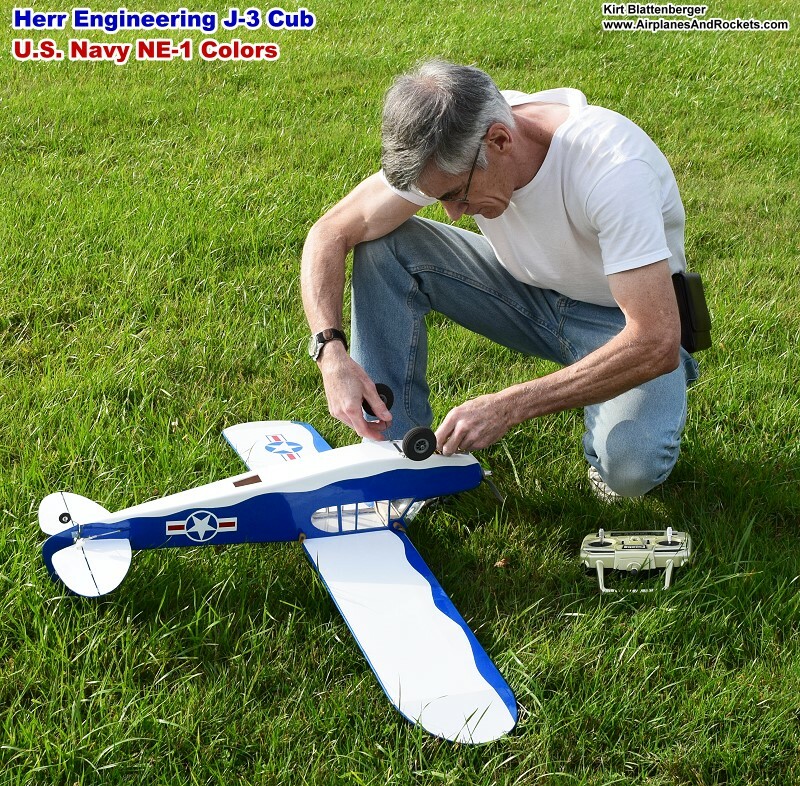 After researching what few options are available in the way of scale ½A kits, I settled on the Herr Engineering ½A J-3 Cub (HRR505). They also have one for electric power, but I wanted something with more robust construction. Sig had the best price I could find. Construction ensued and progressed with no issues. 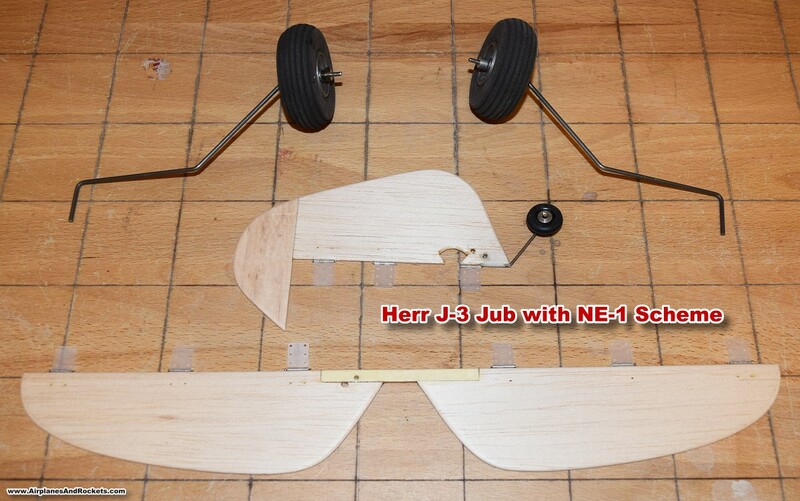 All the parts fit well and the wood quality was very good. A few photos are included below. I prefer using rubber bands to hold on wings, so I replaced the nylon bolt setup with a couple 3/6" hardwood dowels. 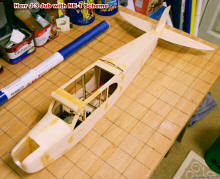 To make things easier, I replaced the transparent top part of the front windshield with a balsa block. It doesn't look quite as scale now, but almost nobody will know the difference. The engine compartment and inside the cabin was coated with butyrate dope for fuel proofing. Conveniently, Sig Miami Blue dope is nearly a perfect color match to the Monokote. 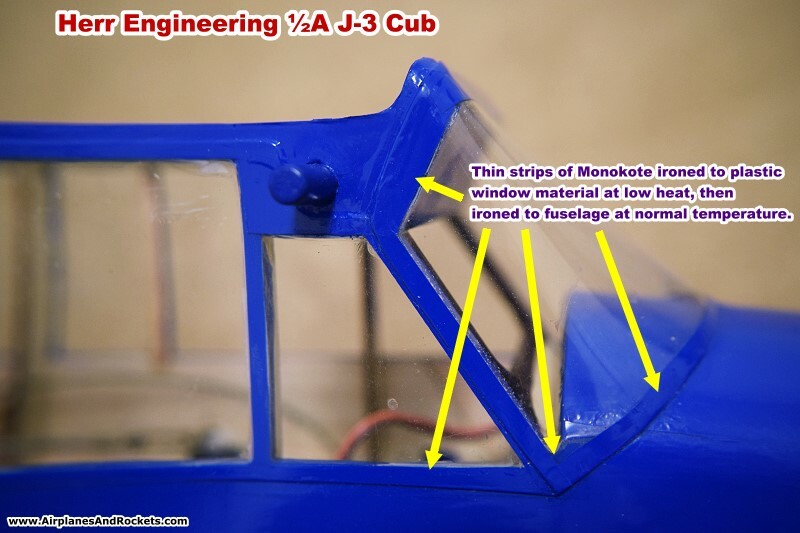 After gluing on the windshield material with thin CA, I ironed on 1/4"-wide strips of blue Monokote so that about half was on the plastic and half on the adjoining fuselage Monokote covering. If you set your iron to where it will just activate the adhesive, it will not melt the windshield. Then, turn the heat back to normal and adhered the other half to the fuselage. This results in a nearly invisible attachment and it's fuel proof and helps keep the window in place to boot! As you might be able to tell from the photos, I build with more emphasis on strength than on saving every fraction of a gram. A little beefing up was done on the J-3 in the landing gear attachment area, and the pre-formed plastic cowl was replaced with a few lightweight balsa blocks. 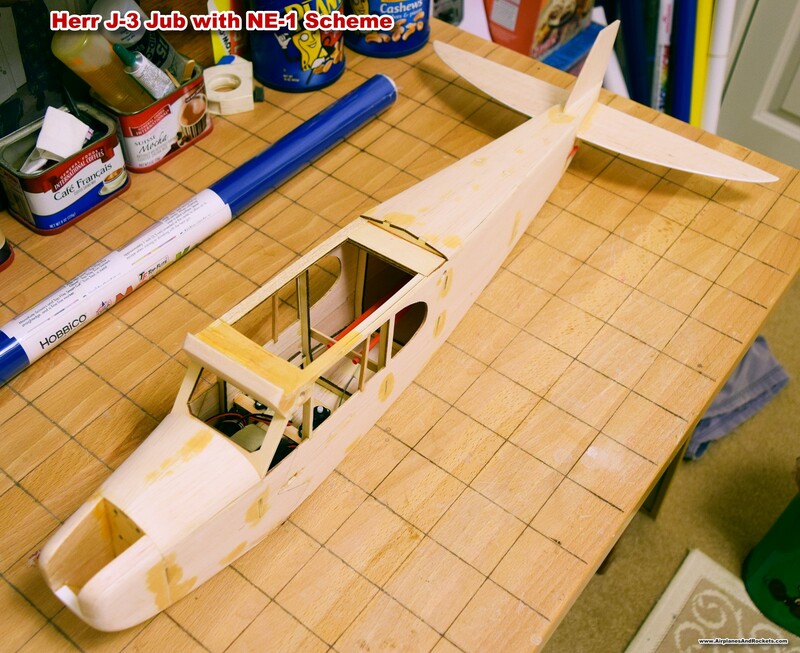 All the pre-built models with their laser-cut, minimal airframes do not seem to be anywhere near as forgiving of hard landings and handling as the traditional sheet framed jobs. Maybe I just need to learn to be more careful and fly better. The radio system is one of the new Futaba 4YF, spread spectrum, 4-channel models. It is a good enough radio, but extra receivers are ridiculously priced at $50 apiece, when the standard 6-channel diversity antenna receiver is only about $40. I definitely do not recommend it only for that reason. 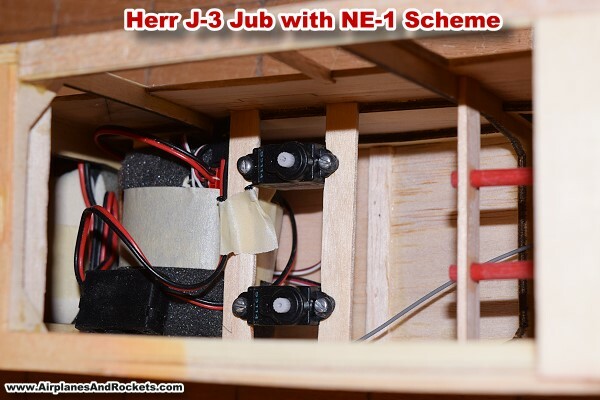 Two Futaba S3114 servos drive the rudder and elevator. As mentioned earlier, a Cox .049 QZ engine was installed originally. Three additional holes were drilled in the muffler to get a little extra power and it seemed to make the run more consistent. I learned long ago not to use less than 25% nitro fuel on an .049 or else adjusting for a consistent run would be nearly impossible. All four of the .049s were broken in with 8-10 tanks of fuel and all run very well on 5x4, 2-bladed props and on 5x3, 3-bladed props. A couple modifications were required to the factory-new .049s. One was to file part of the muffler body to clear the fuel tank since it was pressing on the to of the tank and causing it to leak around the seal to the crankcase. The other was to tap the fuel tank attachment screw holes a few turns deeper to allow the screws to be tighter. I was really surprised at the lack of quality control on those two issues. You can see in the one photo my poor-man's system for checking the wingtip washout to make sure it is correct on both sides. You can buy electronic incidence meters, but my level of aircraft doesn't really need one. The maiden flight was a real handful since the control surface throws were way too great and over-controlling was a real issue. That, combined with maybe a slightly tail-heavy balance caused me to feed in very minimal transmitter inputs. You can see in the video how erratic the flight was for the first couple seconds. Without a way to chop the throttle on the .049, I needed to fly out the entire tank of fuel before being able to make adjustments. That, by the way, is the other disadvantage of using a cut-rate radio system - no dual rates or ability to adjust maximum control throw electronically. Moving the clevises closer to the center of the servo arm did the trick. I have ordered a Futaba 6J programmable radio to replace the 4YF. After the first few flights, I decided to swap out the Cox .049 with a 370-size outrunner motor. I was a little hesitant to use the 370 at first and considered a 400, but as it turns out the 370 and an 11.1 V, 1300 mAH LiPo batter is enough power to pull the J-3 straight up! Lazy flying around with a few loops and some steep climbs gives me more than 15 minutes of flight time. The longest flight so far is 23 minutes and 50 seconds, and that's with a few bursts of power for loops and barrel rolls! A 1000 mAH battery would give plenty of flight time. 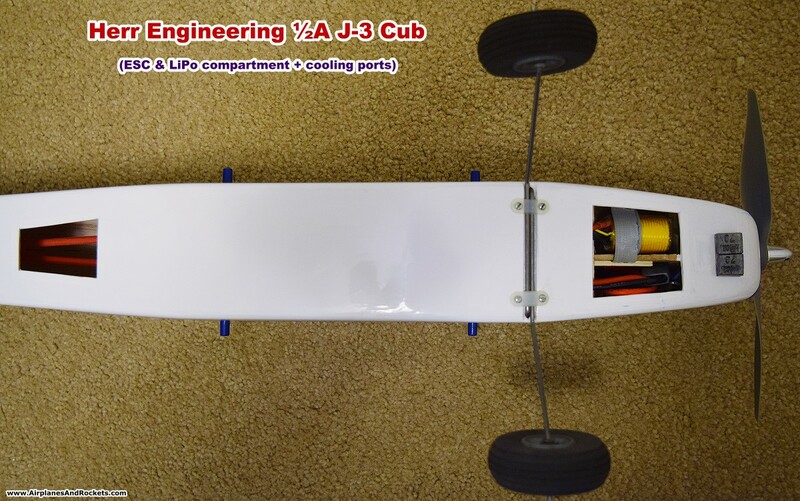 I opted for the 1300 mAH because it easily fit into the big fuselage and because I need the nose weight anyway. In fact, I still added another ½-oz. of lead to the nose just to make sure the center of gravity was plenty far forward. 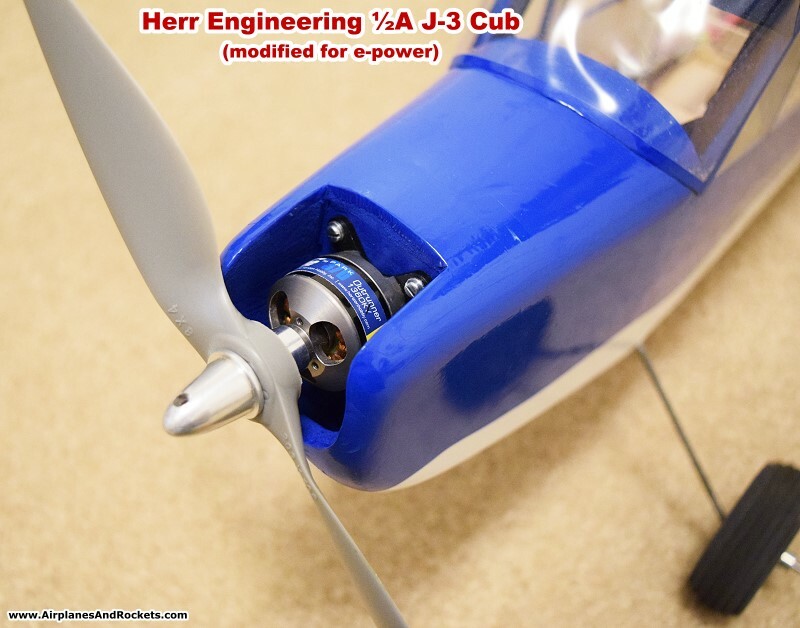 Overall, I highly recommend the Herr Engineering Model HRR505 J-3 Cub for both glow fuel and electric power. 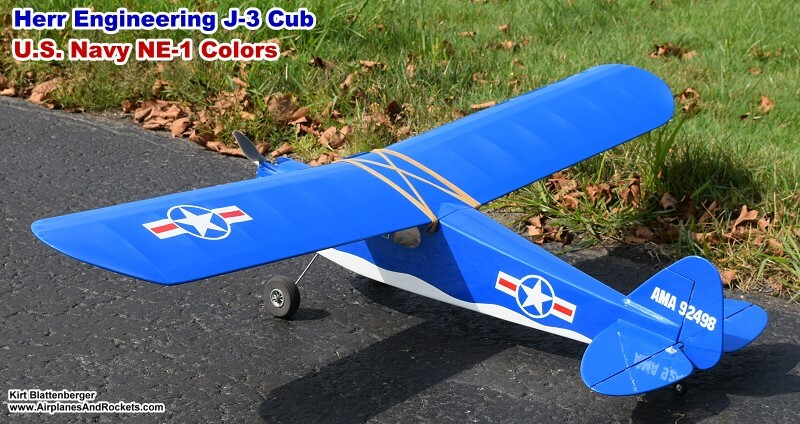 If builds easily and flies great! My Herr Engineering J-3 Cub is finished in U.S. Navy NE-1 colors (sorta). It originally had an unthrottled Cox .049 QZ Bee and had plenty of power. After a couple flights, I exchanged it for a 370-size outrunner motor and an 11.1V, 1300 mAH LiPo. that eliminated the oily cleanup and added the convenience of a throttle. Flying weight w/.049 was 21 oz., w/370 is now 23 oz. The motor/battery combo provides vertical climb performance and I regularly get 15-20 flights (vs. 3-4 min. on .049) when just flying around with a few loops and steep climbs thrown in! 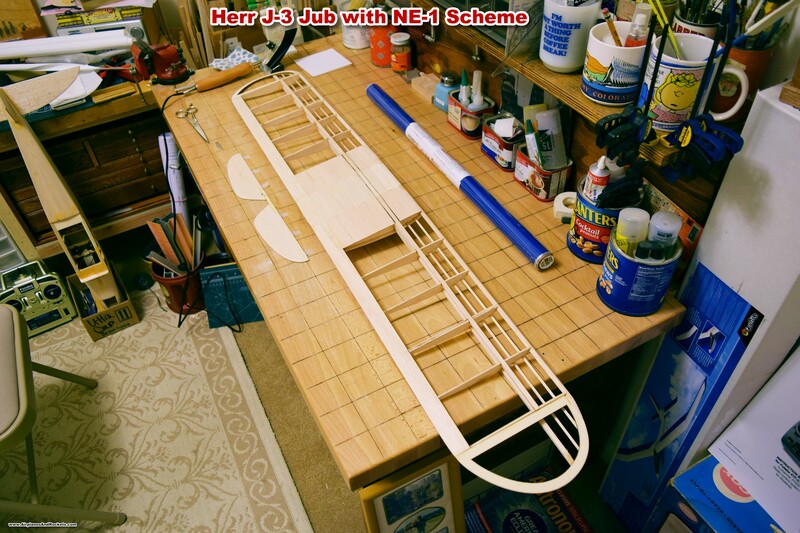 This .049 version of the Herr J-3 is built much more ruggedly than the electric version but is very sturdy and still flies like a dream. 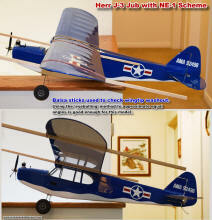 Here is some info on my Great Planes J-3 / L-4 Cub.